We didn't buy the house with the intention of staying. It was a second starter home purchased as part of a move. The intention was to live in the house long enough to get our finances in really good shape so we could sell the house and move up. We would get a bigger house, a nicer neighborhood, and then stay in the new house until retirement. In a good market that plan would have worked. We watched the market take a downturn and when we were informed of a possible job transfer that was most likely going to happen, we watched the market crash. So much for our "investment." We moved three years ago and our Indy house is still our house. We are thankful that, unlike many, we have managed to keep our house payments and financial credit mostly intact. There have been a couple missed payments which had to be made up along the way and we still have little to no room for error, but two renters into the three years and we are still making our payments and chipping away little by little on the principle. That doesn't make the whole situation any less depressing. This was our second house but really our first home. Our first house we enjoyed but between my husband commuting 120 miles a day and me driving into Chicago every day we didn't have much time there. We slept there, sometimes cooked there, and rarely entertained there, but that was pretty much it. While our Indy house was far from what we wanted, it was our first real home. We painted, tore up floors, tore down a wall, put up a new kitchen, and battled with the weeds in our front flowerbed. We gathered in the backyard around the fire pit we built, shared Easter and Thanksgiving dinners with family and friends, and brought our newborn daughter home there. And then we had to move. We didn't put our house on the market because we wanted to move up to something bigger and better. We moved because we had to. Like many nationwide we were transferred and now we had the impossible task of selling a house that we needed to sell for more than people were willing to pay. Our second renter has just moved out and we are waiting (I'll admit rather nervously) for the third renter to sign this week. We returned to our old, empty house this weekend to see what kind of condition the house was left in. It's ok. They didn't abuse the house, at least it doesn't appear that way. There are a couple things they tried to cover up. Like that really bad patch job from what appears to be a pet door between our garage and family room. Yeah, they patched it, found matching paint, but I know that wall. I put one coat of primer and two coats of paint on that wall when we redid the kitchen and family room. That bump and the jacked up baseboards weren't there when the last renter moved out. And yeah, I noticed the fresh dirt in the weed and grass filled front flower bed next to the hostas I planted years ago. Hear that former renter? I noticed. But I know that it could be a lot worse. A lot worse. 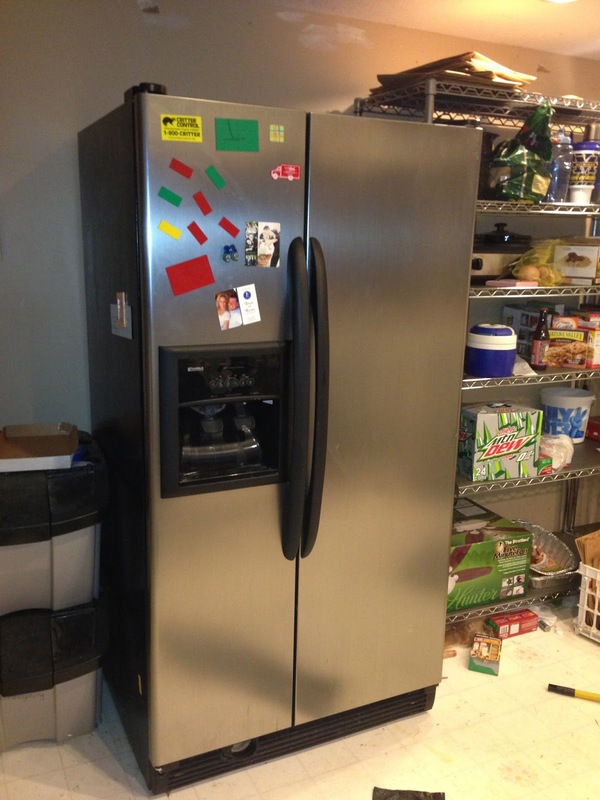 On the bright side we did buy a new fridge to replace the fridge that started our kitchen renovation project. For the last three years, every time we would discuss getting a bigger deep freeze or looking on Craigslist for a "new" refrigerator we would think longingly about our old refrigerator. That fridge was still ours and was being used by total strangers instead of us. It was time to bring it home with us, where it belonged. Thanks to my awesome brother-in-law helping my husband move one fridge in and our fridge out we now have it at home. It was an "adventure." After arriving back at the house with the new fridge from the Sears outlet store we spent at least an hour trying to figure out how to get our fridge out. I hate the crawl space. I don't miss the crawl space at all, but into the crawl space I squatted through the cobwebs with my husband's cell phone flashlight and I found the refrigerator water line. Since no one could hear me through our screaming children who were enjoying the empty, echoy house, I managed to turn the water off, but not all of the way. After spending forever trying to figure out how to get our fridge out of the house, we went to my sister's house and then my husband and brother-in-law extraordinaire (who seriously injured himself the last time he tried to help us move something big) successfully changed everything out, although we did have to return to the house before bed so that we could make sure the water line was completely shut off. There were other things to fix. We got parts, like a new kitchen faucet and caulk for the bathroom, but we finally decided that we couldn't deal with it anymore. We needed to get home, to our real home. We left the rest of the repair work for our realtor's handyman. Getting the fridge home continued the adventure. There was a moment when we were getting the fridge from the truck to the garage where I had a flashforward of the fridge careening off of the ramp and either falling backwards on my husband or crashing forwards into the garage door destroying both the fridge and our house. My husband had a flashforward of the fridge falling over on me. Needless to say it left both of us shaking for the next hour, but it is now safely in our utility room. It's difficult to go back. I hate going back. I don't miss the house and the move was the right thing, but three years later I still struggle with the fact that we had to move. The move led us to a house with potential and brought me a Master's degree and a job that is closer to my dream job than I ever imagined. But there are still days it is difficult. Being back in the house that holds so many memories doesn't help. It's not even bittersweet anymore because it is so far from sweet. It is a tie that keeps me from being able to completely move on. Friendships remain, we still have family ties, but it's the stupid house that keeps us going back. It's a tie I wish we could sever, but it looks like we're still stuck with it. Our rental experience hasn't been perfect. We've had our fair share of issues but at least the last two renters have left the house clean and mostly ready for the next renter (or buyer if we can ever get rid of the house). A short talk with old neighbors yesterday confirmed that our neighbors two down haven't been so lucky, and we know that before the house next door went to foreclosure the same was true there. Messy, destructive tenants leaving the property much worse than they found it. At least our house is still intact. I guess for now that is the best we can hope for.